Ingredients: black pepper, chilies, salt, onion, paprika, and other herbs and spices. Heat Level: – Hot. ‘Nuff said. 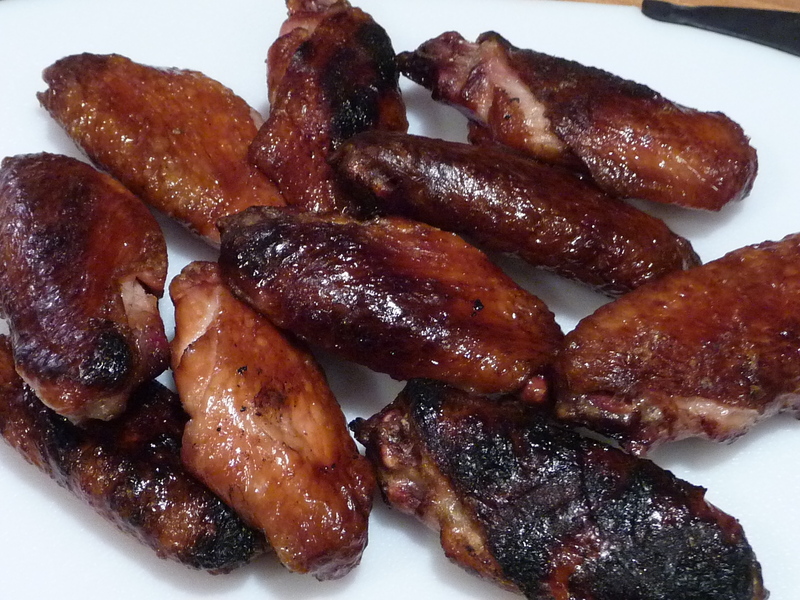 The instructions on NorCalBBQ.com said to sprinkle the rub over the wings. I may have over-sprinkled. I used it as one would use a “rub”, when in fact it’s more of a spicy hot seasoning. Sprinklers beware! 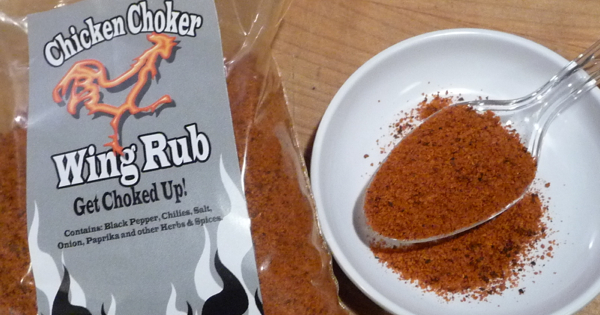 Overall Rating: – We’ve already established this rub is hot – fiery hot. I had hoped there would be more depth to the flavor. More garlic, less black pepper. 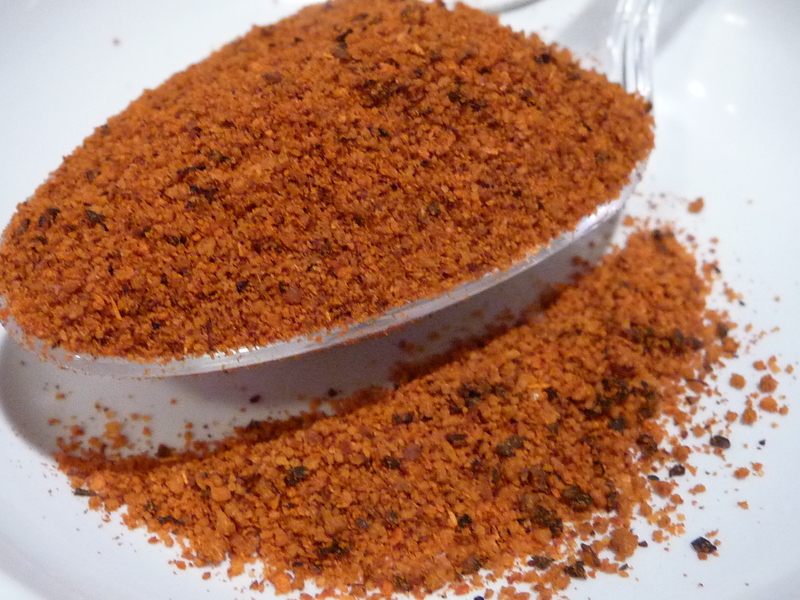 But overall, it’s a winning dry wing seasoning that you must try for yourself. Nice package in a resealable bag. 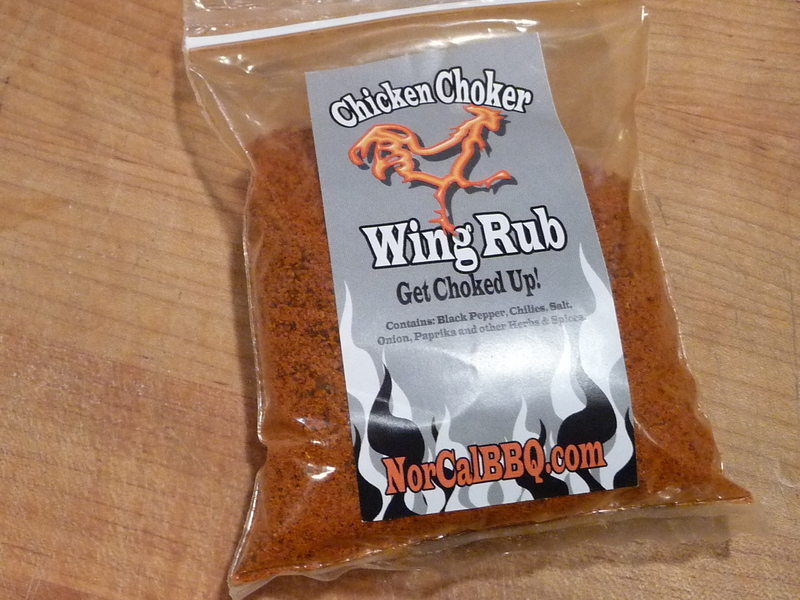 You can purchase Chicken Choker Wing Rub here. I gotta try it.. Love those hot wings. Hmmm….tossed in butter, yet still dry? I wonder if this may have been even more successful if you had rubbed up the wings previously and “marinaded” them over night, rather then tossing them afterwards….it may have cut the saltiness for you…?? We followed the directions, cooking them however you like, then dipping in butter and sprinkling on the seasoning. I agree, Firehead, that next time we’ll treat them like we do most dry-rubbed wings, and coat before grilling. The treatment of seasoning them at the end reminds me of Rendezvous ribs. I do like a dry rubbed rib too, but have to have some wet ones to go along with it. Thanks for the review. I’ve used this rub on everything, Ribs, Brisket, wings, dips and on eggs. 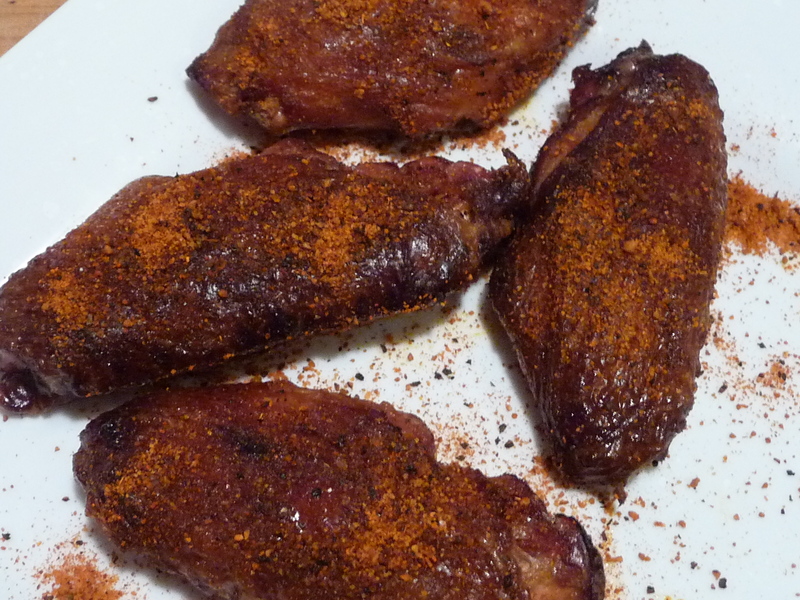 Using the rub like a marinade is good and its how I did them when I first came up with the recipe while working at a wing shop in town. I going to use it in some chili for a contest in a couple of months to turn up the heat on the judges.. ha h hahah. Let me know if you guys got any more questions. Thanks again Brian and happy birthday. Wow, that is a wide range of foods that your rub is good on. Thanks for sharing that info with us all. You’ll have to let us know how you made out in the chili contest! And thank you for the opportunity to review Chicken Choker. Will do. We got a few Chili contest coming up and we are going to start our Chicken Choker Challenge shortly. We are going to pop up in a few bars to see can handle the NEW Supper Hot All You can Eat contest. this rub is fantastic ,Jeremiah Johnson knows how to make a rub that you can use on anything as a rub ,as a spice additive in your food,as a marinade ,check out his entire line of rubs and sauces @ Nor Cal BBQ OH and pay attention for his latest coming out soon it’s gonna be a BANG!!! Yea, I’m looking forward to it, Lon. Thanks!